Neha Joshi: Maharana Mewar Foundation awarded Maharana Rajsingh Award to Neha in 2004. 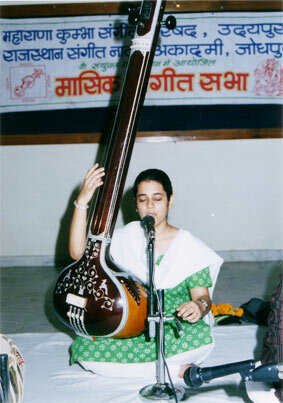 Neha Joshi is well-known in the young generation for her music. She passed MA (Music) from Mohan Lal Sukhadiya University, Udaipur (Rajasthan) and secured second position in University. She passed "Sangeet-Bhushan" and "Sangeet-Prabhakar" with first division from education department Examination, Bikaner (Rajasthan). She also passed courses from "Prayag Sangeet Samiti", Allahbad with first division. She also passed her MA from Akhil Bhartiya Gandharva Mahavidhyalaya Mandal, Mumbai with first division. She also passed from Surnandan Bharti, Kolkata. She received many awards at National, State and District level. She gave her presentation at various places with famous artists. She got scholarship from various organisations.